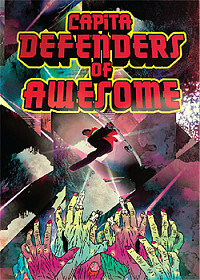 Defenders of Awesome DVD by Capita features the 2011 Nominees for Mens Rider of the Year, Womens Rider of the Year, and Rookie of the Year. The Capita team is stacked and delivers hot action in this rare team snowboard movie. DVD menu included with special features and hidden gems not released online. Featured Rideres: Scott Stevens, Dan Brisse, Phil Jaques, Jess Kimura, Brandon Cocard, Cale Zima, TJ Schneider, Dustin Craven, Laura Hadar, and More.